The historical highlights featured in This Week in House History are written by the historians, archivists, and curators who preserve the history of the U.S House of Representatives. New highlights are added weekly. The collection, searchable by date or subject, includes more than 400 historical House events. 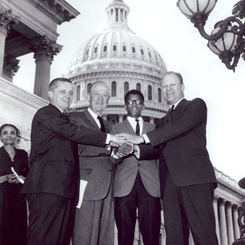 On this date, Frank Mitchell became the first 20th-century, African-American Page in the U.S. House of Representatives. Congressman Paul Findley made the historic appointment. Mitchell’s appointment and arrival in Washington, DC, received national media attention. Findley represented portions of the congressional district once represented by Abraham Lincoln. On this date, freshman Members of the Democratic Caucus gained control of the House Floor for roughly four hours. The group, led by Congressmen Edward Mezvinsky of Iowa and Gerry Studds of Massachusetts, consisted of 30 Members of the newly formed Freshman Democratic Caucus. 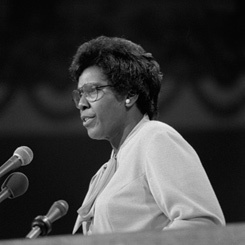 Traditionally, freshman Members were not encouraged to express their views on the House Floor and followed the old adage of being seen but not heard. Fueled by the House’s recent inability to override a spending veto by President Richard M. Nixon and what Members perceived as the President’s usurpation of congressional power, the caucus prearranged floor time to express its views. On this date, Walter Fauntroy was sworn in as the first African American to serve as the District of Columbia’s Delegate. 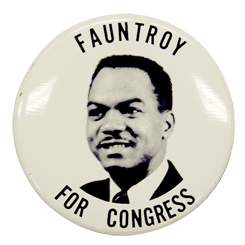 Fauntroy’s entry onto the national political scene was made possible when Congress passed the District of Columbia Delegate Act in 1970. The legislation reinstituted a nonvoting Delegate to represent the nation’s capital in the House of Representatives, a position last held by Norton Chipman from 1871 to 1875. On this date, Queen Beatrix of the Netherlands addressed a Joint Meeting of Congress to celebrate 200 years of unbroken diplomatic relations between the United States and the Netherlands. 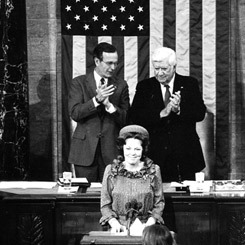 Queen Beatrix was the third member of her family to address Congress. Although the royals are symbolic leaders, the Dutch have never sent a non-royal to address the Congress. Visit the interactive timeline to view significant institutional and legislative milestones from House history.